It has happened to all of us. If you were lucky, you were able to catch your mistake and correct it before your dish was ruined. If you weren’t so lucky, then you probably had to swallow your pride and serve the fish that had suddenly taken on the appearance and characteristics of a hockey puck. Regardless of the outcome of your mistake, don’t be discouraged. Rest assured, whether you are a veteran or a newbie in the kitchen, we have all made our share of mistakes when it comes to using a pressure cooker. If you can learn from your mistakes, you’ll be a better chef for it. If you want to improve your performance with your pressure cooker, read on to find out how to avoid 12 common mistakes beginners make when using a pressure cooker! 1. Your pressure cooker explodes. Admittedly, this problem is not related to food quality, but you’d be surprised to learn just how common it is. Low quality pressure cookers wear out fast. Many of their problems can be attributed to pressure leakage and improper locking. If your pressure cooker is locked, and there is no way for the steam to escape, then it will explode as its temperature rises. Because pressure cooker gaskets perform such a critical function in ensuring that the steam and gasses remain inside the cooker, it is equally important to properly maintain them. 2. You are unfamiliar with the recipe you are cooking. When you are using a pressure cooker, you cannot check and monitor the dish while it is cooking. This is where novice chefs make a fatal mistake by guessing the status of their food. If you’re over-confident in your assumptions, your food will be overcooked. If you’re not confident enough, your food will resemble the aforementioned hockey puck. Hence why it is so important for your timing to be on point. Any food cooked in your pressure cooker should be precisely according to the time mentioned in the recipe you are following. 3. You are trying to cook foods with different time requirements together. Not all food items are going to require the same amount of time to cook in your pressure cooker. There is essentially no successful method for cooking all of your items together in your pressure cooker. If you do want to cook all of your ingredients together, you have the option of preparing the items that take longer to cook before placing them in your pressure cooker. After you know that all of your ingredients will have the same cooking time, you can put them in the cooker together; however, be forewarned. This technique requires much practice and an intimate familiarity with the cooking speed of your pressure cooker. 4. You aren’t filling your pressure cooker with the proper amount of food. Your pressure cooker should be filled approximately 2/3rd of the way full when you are preparing a dish. If you don’t put enough food in it, there is a chance that it could explode due to high internal pressure levels. If you put too much food in it, your food won’t cook properly. Most modern pressure cookers have markings inside of the cooker to indicate where the 2/3rd mark is. 5. Your locking mechanisms are wearing out. Neglecting to maintain the locking mechanisms of a pressure cooker is one of the most common mistakes beginners make. For older models, or pressure cookers that are used on a daily basis, the rubber insulation and pressure seals will begin to wear out over time. This prevents the cooker from properly locking, and it affects the quality of the food you are preparing. These components must be replaced every 6 to 12 months. 6. You are adding too much water to your pressure cooker. It is common for newbies to use the same amount of water in their pressure cooker as they did when they were cooking with open pans. Remember that only a limited amount of steam can escape a pressure cooker while it is working, and any additional water in the cooker will be retained by the food. What results is a soggy, watery, and unappetizing mess. To avoid this issue, make sure that you adjust the water levels of your recipe to meet pressure cooker requirements. 7. You are cooking foods in your pressure cooker that are better suited to a pan. While pressure cookers are simple and convenient, there are some meats and vegetables that are better suited to being cooked in a pan because of the close attention their texture and color require. Others are delicate and cook quickly. Rather than blaming your pressure cooker for bad food quality or poor texture, first make sure that you’re cooking your ingredients in the right implement. 8. You’re overheating and drying out your food. You’d be surprised to find out just how common this problem is. When using a pressure cooker, the cooking temperature has to be perfect. If the ideal temp is exceeded, your food will dry out and burn. Insufficient water content also leads to burned and dried out food. Make sure to follow your recipe’s temperature recommendations and cooking time closely. 9. You aren’t properly releasing the pressure in your pressure cooker. This problem is primarily confined to stovetop pressure cookers (non-electric); however, it is an important one that should be addressed. Many beginners are unfamiliar with the proper pressure release technique and timing for the recipe they are preparing. If you do not release the pressure accordingly, your ingredients will continue to cook, which will affect the quality of the final product. Make sure that you take note of these elements before you start trying a new recipe. 10. You’re using the wrong sized pressure cooker. This problem is closely related to the issue of overstuffing/under filling your pressure cooker. Pressure cookers are available in multiple different sizes, but usually range from 4 liters to 8 liters. A standard 6 liter pressure cooker will usually suffice to cook a meal for 4 to 6 people. 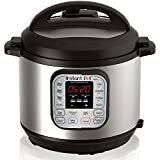 The size of the pressure cooker that you purchase should be bought in accordance with the number of people you usually cook for. Make sure you buy the right size for your needs. 11. The sauces you are preparing are too thick. Remember that pressure cookers release moisture at a slow rate. The heat often causes sauces to caramelize, burn, and stick to the bottom of the pan. To avoid this mistake, use diluted sauces only. If you must use a thicker sauce for the dish you are preparing, use as small a quantity as possible, and use a lower heat setting than what is called for. Be aware that this does prolong the cooking process, so you’ll need to adjust your prep time accordingly. 12. You’ve boiled your food to death. Last, but not least, boiling items in your pressure cooker is something that is best reserved for stocks, stews, and soups. Some ingredients are best braised or steamed. Change up your cooking methods, and you’ll be surprised at how much flavor your food suddenly has.